Item is pre-owned so measurements may differ from stated tag size. Measurements are approximate and taken with item flat. Waist (double for full measurement): 15.5 Rise: 8 Inseam 27 There is a very small spot on the jeans noted in the photos. It is about half way down toward the inner part of the leg otherwise good condition. Item ships from a smoke free home. 38in TOTAL Length (From Waistband along outside Seam). Waist laying flat 18” Rise 9.5” Inseam 30” S Some wear on the bottom hems as seen in the photos. Distressed Please ask any questions prior to bidding or purchase. All measurements are to be considered approximate. I'm always happy to combine shipping, so be sure to check out my other items for sale. Light was. The material is light cotton. 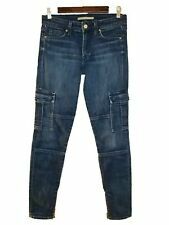 Two by Vince Camuto Jeans High Rise Size 29/8 Blue - NWT! 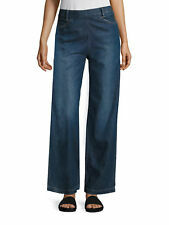 From Two by Vince Camuto, these jeans feature Front button & fly closure. Machine wash. ; Pictures are important! Cargo Jeans. Army Green. Size 28 Inseam 29. 100% Authentic. Zip Ankles. Fabric: 98% Cotton, 2% Polyurethane. Color: Faded Black. Thigh: 9.5. Inseam: 31. Details: Five-pocket jeans with a super-slim silhouette get updated with modern color. Zip fly with button closure. Machine wash. By Vince; made in the USA. Designer: Vince. Color: Almond. Material: 98% cotton, 2% spandex. Highly stretchy material gives great curve-hugging and a comfortable fit! You will feel amazing in these jeans! Good Condition - w/ light overall wear. Have scattered, pale discolorations and stretch lines along the front and back rises. Excellent condition, no flaws. 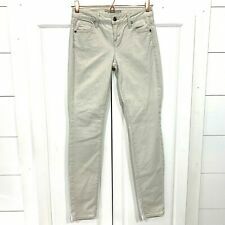 Vince Riley Gray skinny jeans. Inseam: 30". Vince Wide Leg Jean - Super Cute! Relaxed wide leg silhouette. Back patch pockets. Concealed side zip with snap closure. 100% cotton. Color: Gray, Faded Black. Inseam: 26. Fabric: 66% Tencel, 31% Cotton, 3% Elastane. Excellent condition! Rear Pocket has a minor stitching loose. Vince Skinny Jeans. Made in USA. Vince green Ankle Skinny Jeans. Size 29. Waist 15” Rise 9” Inseam 27” All measurements are approximate. Style: sheer silk Trouser. Waist- 16" (32" Around). Tuxedo Stripe. Skinny Jeans. 42% Lyocell/33% Cotton/15% Rayon/9% Polyester/1% Spandex. In gently used condition - small mark on back pocket - see picture. Vince Stretch Skinny Jeans In Mulberry. - Zip fly with button closure - 5 pocket construction. Inseam 30". Waist 14.5" across. Great condition! These acid-wash skinny jeans feature 5-pocket styling and a single-button closure. 11" leg opening. Narrow through the thigh. In excellent, pre-owned condition (gentle wear and wash). Wash cold. 32" inseam. 14.25" waist laying flat. VINCE Skinny Ankle Jeans. Gently used. Light scuffs on one leg. See photos for details. Wash: Pacific. DETAILS: Stretch denim. Fitted through skinny leg. Five-pocket style. Made in USA of imported material. FABRIC: Cotton & spandex. CONDITION: Excellent. 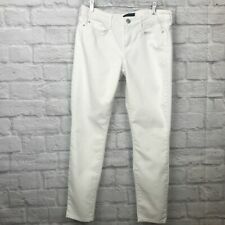 Item: Women's white skinny jeans with a destroyed look to them they don't actually have any holes/rips. Brand: Vince Color: White Material: 72% Cotton, 28% Polyester Size: 25 Measurements Approx. : Across Waist 14, Inseam 28in Condition: VVGUC, comes from a Smoke and pet free home Shipping prices are calculated via zip code. Please note all my items are weighed when listed to ensure accurate shipping prices for the each item. RETURNS AND REFUNDS: I try very hard to be accurate in my descriptions, but do occasionally make errors. If there is an error on the listing or with the item itself please message me first so we can try to resolve the issue. If you have any sizing questions or something doesn't sound quite right in the listing, please ask questions before you bid/buy and I will try to clarify ASAP. Material : 42% lyocell, 32% cotton, 15% rayon, 8% polyester, 3% spandex. Condition : Gently used. Size: 27 x 30. Waist:13.5" across (27"). Back room rear drawer 7. Front patch trouser pockets; back patch flap pockets. 97% cotton, 3% spandex. INSEAM: 27”. 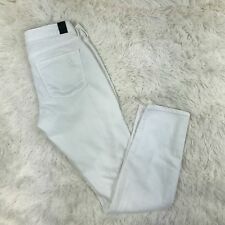 Womens Vince Camuto Ombre Skinny Jeans Size 29. Condition is Pre-owned. Shipped with USPS Priority Mail.